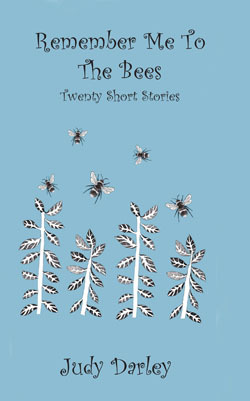 A few of you have been asking for updates on my debut short story collection Remember Me To The Bees. Thanks for your interest! Well, the book exists, which is really exciting! The official launch (more details to follow) will be in March this year, and it will be widely available from that point. The book contains twenty of my short stories, each accompanied by artwork from the talented Louise Boulter, who also designed the gorgeous cover. Yeeps! No wonder I blushed. “The twenty stories in Judy Darley’s debut collection cover the moments that make us the people we are, where actions are taken and sights seen that will change the protagonists’ lives forever – with sometimes startling consequences. Over the next few weeks you will see copies of Remember Me To The Bees popping up in independent bookshops and art galleries across Bristol and beyond as well as appearing on sites such as Tangent Books’ online bookshop. Go on, buy a copy, and make a writer very happy! This entry was posted in Judy's writing and tagged Remember Me To The Bees, short story collections by Judy. Bookmark the permalink.